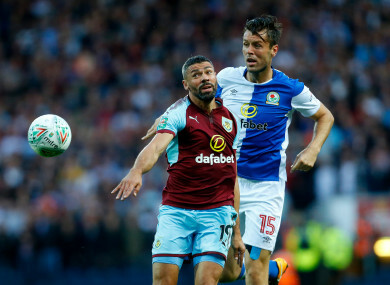 Blackburn's Elliott Ward in action with Burnley's Jonathan Walters (left). THERE WAS WORRYING news for Ireland fans tonight, as Jon Walters went off injured during Burnley’s League Cup tie against Blackburn this evening, though international team-mate Robbie Brady managed to get his name on the score-sheet amid a 2-0 win for the Clarets. The 33-year-old attacker required treatment after picking up a knock to his ankle early on, and attempted to continue before eventually making way for the club’s record signing, Chris Wood, after 42 minutes. The seriousness of the injury has yet to be confirmed, though it could potentially rule Walters out of Ireland’s crucial upcoming 2018 World Cup qualifiers. The Boys in Green travel to face Georgia on 2 September, before coming up against current Group D leaders Serbia at the Aviva Stadium three days later. Meanwhile, in better news for Martin O’Neill, Brady put Burnley 2-0 ahead with a blistering finish on the stroke of half-time, after Jack Cork’s opener. Kevin Long also made the Clarets’ starting XI this evening, while ex-Ireland U21 international Derrick Williams was part of the Blackburn line-up. Email “Watch: Blistering Robbie Brady finish gives O'Neill reason for cheer after Walters woe”. Feedback on “Watch: Blistering Robbie Brady finish gives O'Neill reason for cheer after Walters woe”.